Join us on an excursion along the Grands Crus wine route. The touristic Grands Crus wine route passes through the finest and most prestigious of the Burgundy vineyards. We'll stop along the way for a wine-tasting* session. 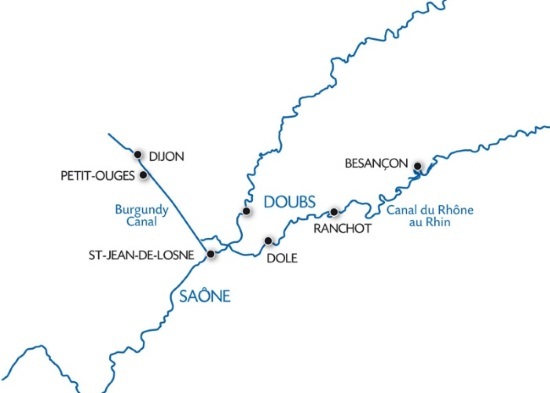 We'll return onboard and cruise to Petit-Ouges, discovering the magnificent lush, green landscapes of the Saône Valley. Upon arrival in Petit-Ouges, discover the "Path of the Three Wash Houses” (1). The whole day will be spent cruising towards Saint-Jean-de-Losne. Take the time to sit back and admire the vineyards and scenery that we'll slowly pass by as we cruise. We'll arrive in Saint-Jean-de-Losne late in the afternoon. Join us on a visit of Saint-Jean-de-Losne, the capital of canal barging in France, which lies at the heart of the French waterways and canal system in southern Burgundy. The afternoon will be spent cruising towards Dole. Join us on an original and unique tour, following the "trail of the Chat Perché”. This trail refers to the famous tales of a Perched Cat, written be Marcel Aymé who lived in Dole as a child. It also refers to Dole's location, which is perched on a beautiful hillside. We'll return onboard and cruise towards Ranchot. You can use the bicycles (available on board) to ride on the bike path that follows our route on the canal. The morning will be spent cruising. In the afternoon, we'll set out by coach to Arc-et-Senans for a tour of the Saline Royale. Listed as a UNESCO World Heritage Site, this royal factory, built between 1775 and 1779 in the shape of a semi-circle, was where salt workers traditionally lived and worked. Tonight is our gala evening. Enjoy one last buffet breakfast on board before disembarking at 9:00 a.m. Transfer by coach to Dijon. End of our services.